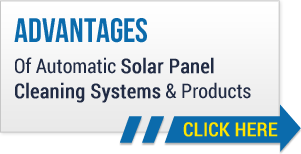 While there are automated systems available to do the job, there are many out there who, for a variety of reasons, prefer manual solar panel cleaning. The cleaning of solar panels is a job that must be done right. For those who have chosen not to install any of the solar panel cleaning systems available to them, here are some things we would like our residential and commercial customers to remember when doing the job themselves. Be Careful. Exercise extreme caution and care when going up on your roof and cleaning solar panels. This may seem like an obvious point, but it is perhaps the most important one we can make. Remove all debris from your panels. This includes sticks, leaves or any other type of debris that has the potential to cause a malfunction in your panels. Check panels for exposed wires or cracks prior to washing. If you find any, make certain they are fixed before you wash.
Use soft water if possible. Hard water can leave permanent calcium deposits on your panels, which can reduce their efficiency. Choose the right cleaning solution. Some cleaning solutions can actually cause damage to solar panels. Scrub gently. Be gentle while removing dirt from your solar panels. Be gentle while drying. Scrubbing or drying in too hard of a manner can cause scratches on panels. Most owners clean their panels twice a year, with the most dedicated of them doing so every three months or so. At the end of the day we want your solar panels to be as efficient as they can possibly be. Following the tips listed above will allow you to keep your panels clean and efficient without investing in an automated system.